Live For Food » Blog Archive » What’s in Lamb and Beef? Red meat tends to get quite a bad press because of the link with saturated fat which is demonised (perhaps unfairly) in the popular press. Many people trying to eat healthily probably try to eat lean poultry and fish as their main source of protein. However we shouldn’t forget that lamb and beef, and other red meats, are not just lumps of protein and saturated fat. Something I didn’t realise myself until quite recently is that not all the fat in red meat is saturated. I found a table of the fat content of various types of meat in a book I have, and the fat seems to be split half and half between saturated and unsaturated for most cuts of lamb and beef. Looking down the list of white and red meats, the fat and protein contents are not significantly different. The whiter the meat, and the leaner the cut, indicates lower calories, however the meats that come out with the lowest calories per 100g are guinea fowl and rabbit, followed by pork fillet. I found this quite surprising as I would have thought turkey was the lowest. All meats are also good sources of vitamins and minerals. 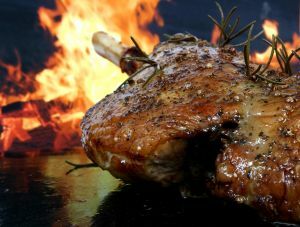 Lamb has 0.21mg per 100g – which would be a reasonable serving size. So the cereal wins here. Lamb is probably the winner here because the portion size would be bigger. It would be quite a chore to munch through 100g of spinach. Milk has 1.1mg of zinc per 250ml, which is a standard glass of milk. I imagine you would have about half this on cereal. Lamb has between 2 – 6mg of zinc per 75g. Lamb is the clear winner here. So what’s the lesson here? Don’t write off any food. Most foods have good points in their favour and some bad ones against them. Try and eat a variety of foods and you will increase your likelihood of getting all the necessary vitamins and minerals in your diet, and you will have a more interesting diet as a bonus! So if you don’t currently eat red meat, why not give it a go once or twice a week to see what you think. It might prove a worthwhile addition to your diet. We’ve never eaten lamb and I’m not sure if we can even buy it around here. Thanks for the great information. Is lamb not popular or available in the US then? (I think you’re in the US?) I didn’t realise that – its pretty common in the UK. It’s the same in Canada. Your Aunty had never eaten lanb till she came over here! It became very common over here in the 50’s because of our links to Australia and New Zealand. It was cheap and tender compared to the beef that was around then. The US is more suited to raising cattle. We never ate chicken when I was little either as it was a real luxury item. It isn’t now, thanks to Bernard Matthews!!!! I suppose we still see a lot of New Zealand lamb in the shops these days. It seems odd to me to think that a lot of people from over the pond have never even once eaten lamb. Its kind of the way we think about venison or goat or something! The US is all about enormous cattle ranches I guess.